I just returned from Junkie Fest 2018 ... so much love, laughter and stamping goodness. One of my favorite classes was the Concord & 9th Turnabout Class. The tips they provided were so helpful in getting good background coverage every time. 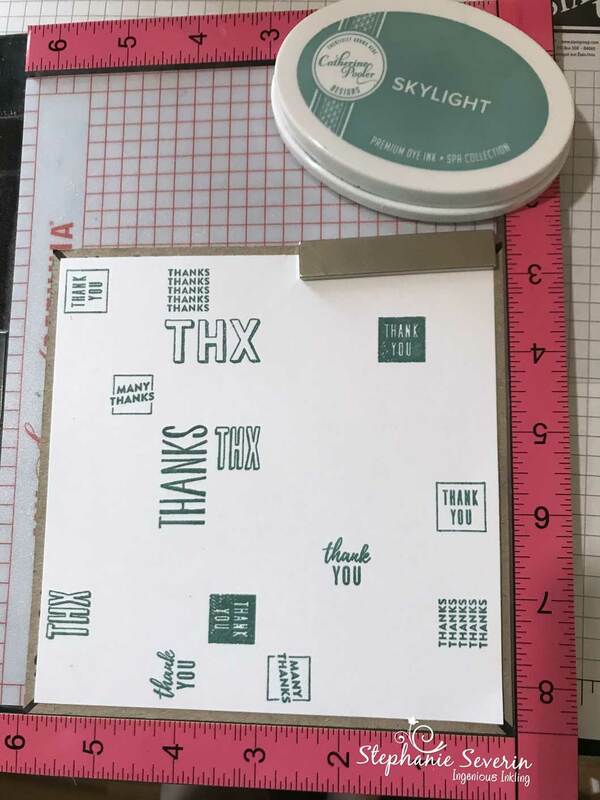 The starting point is creating your 6" chipboard base template and drawing an *X* on it with a Sharpie marker from corner-to-corner. 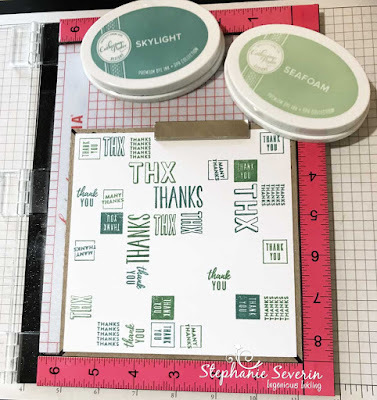 It's also helpful to number the top right corner of each side 1 through 4, so when you rotate for stamping, you can remember your order (I know I'm not the only one who needs a little help). The template can then be reused multiple times. The second step is to print out the template for the stamp set you are going to use and line-it-up so you can use a sharpie to draw the same corner-to-corner *X* on the back of your stamp set (on future stamp sets this will be on the back of the set to make it even easier) Make sure you print it at 100% (my print setting defaults to fit-to-page, which prints it slightly smaller unless you un-check that setting, so make sure you're at 100%). Next step is to place your Template in your MISTI and then center the *X* on your stamp with the *X* on your template ... once the stamp is lined-up perfectly, then pick-up the stamp with the lid if your MISTI. 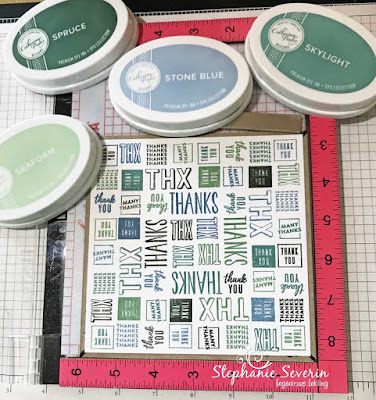 Use a little adhesive to attach your square of paper for your project in the center of your chipboard template (the border should be equal on all sides and the corners should be on the Sharpie lines). For this card I used a 5.75" squire piece of paper (in class we used 5.5" but I wanted to be able to have a little wider border). 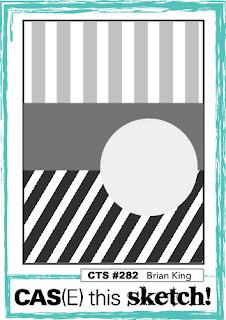 Today I'm using the Concord & 9th Many Thanks Turnabout Stamp and four colors of Catherine Pooler ink from her Zen Garden Spa Collection inspired by this photo at the Home Sweet Home Time Out Challenge. 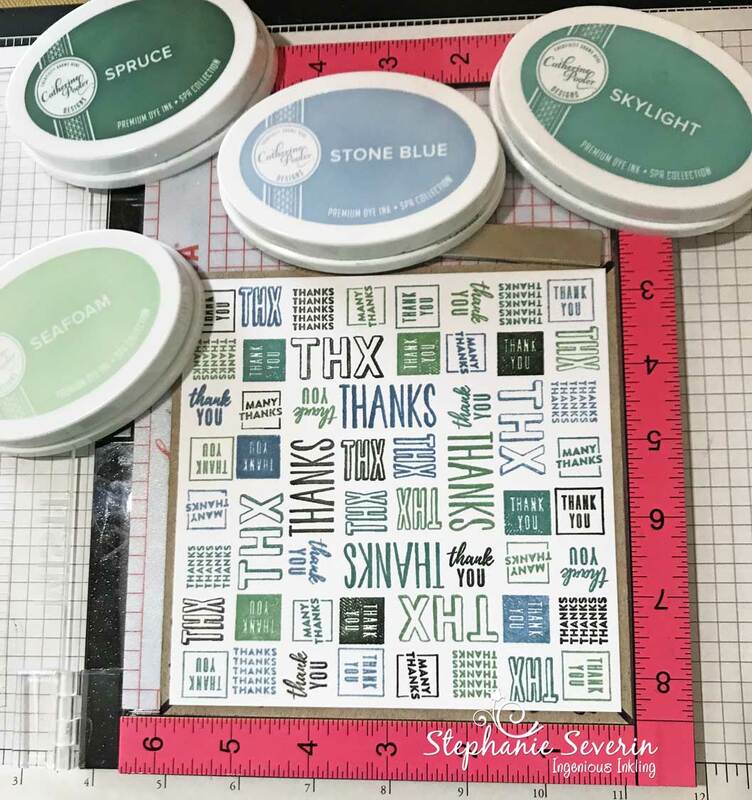 I started with Skylight ink for my first stamping. I found that for me with this particular ink, it worked better if I inked the different sections of the words separately vs. trying to get coverage all at once (that's the joy of using the MISTI). You'll figure out what works best for you. 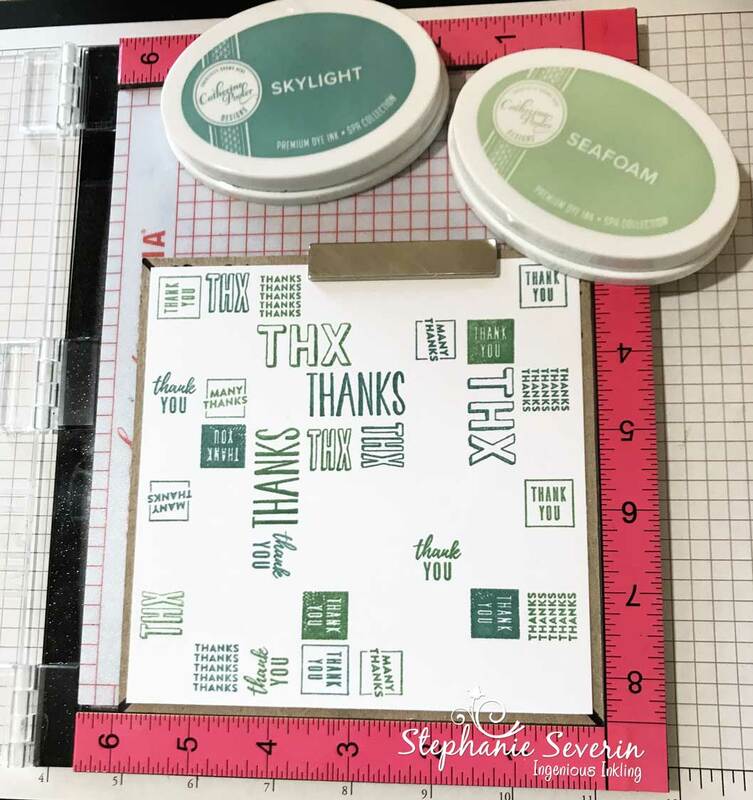 I rotated my template (with the paper attached) one turn clockwise and stamped with Seafoam. Love how you can see the image start to come together. My third color was Skylight. And I finished with Spruce, my darkest shade. The joy of these stamps it that you can decide how many times you want to ink and stamp (I could have stopped after stamping two colors and then added some of the other sentiments stamps included with the set. 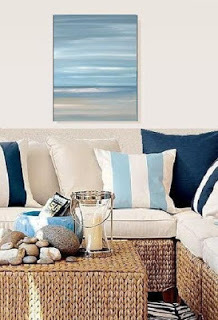 Next I used the same four colors with a little water and paintbrush to create my card base ... it was inspired by the picture in the wall in the Inspiration Photo. For my first card, I trimmed-off three rows of my stamped sentiment and attached it to some burlap paper to bring in the texture of the furniture in the inspiration piece. 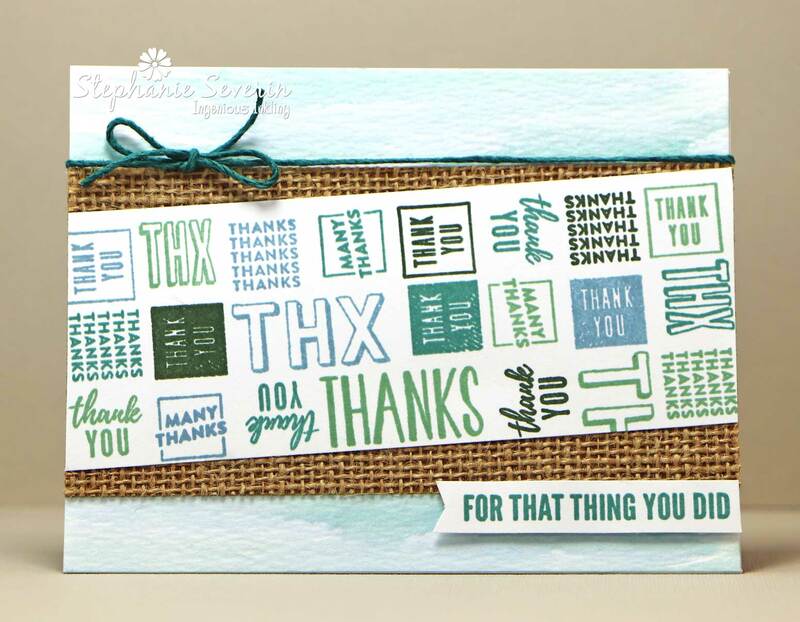 I added a warp of coordinating twine and another stamped sentiment from the set to complete the card. I trimmed the remainder of my background into two pieces to create a card using the layout from CAS(E) this Sketch. I thought the lines of words worked well for this pattern. I mounted the pieces on a 4" wide Stone Blue card base and added a strip of Spruce cardstock between the pieces. I finished with a speech bubble & hashtag stamp from the same set. 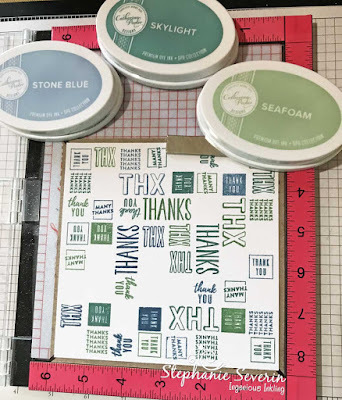 Angie mentioned that they try to make sure that they include as many stamps as possible to use every inch of space in a stamp set, and I really appreciate all of the fun little sentiments in this set. We also got a sneak peek of the next turnabout they will be releasing ... it is pure Autumnal Amazingness ... you're going to love it. Thanks for hanging out with me today ... hopefully you can use these steps to be even more proficient with your Concord & 9th Turnabout Stamps and your MISTI. Great job explaining the best ways to use the Turn-Abouts Stephanie! I can't wait to try mine this weekend! Love how you mixed it up and got two cards out of one panel. Great job. Great job......it was a very informative class, for sure! The light bulb just went off! 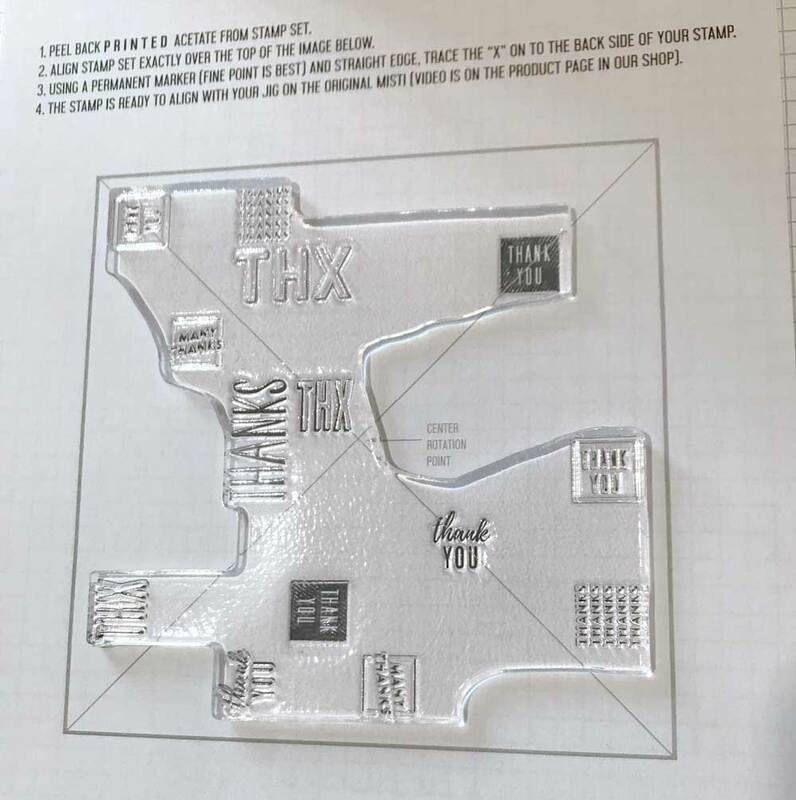 Now I need to make the template and dig out all those stamps!! Wow It's very very cool job! Thank You! Who can do my homework for me ?